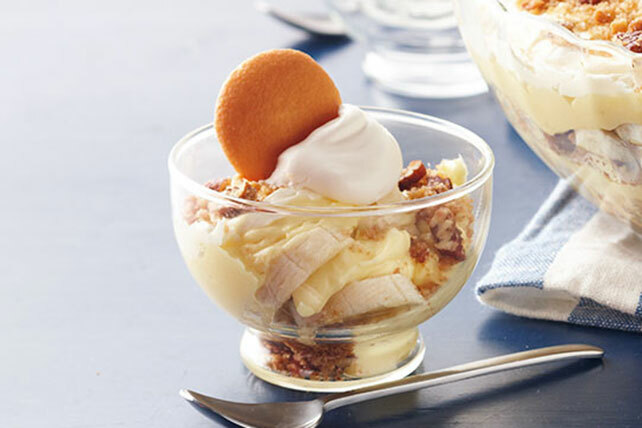 As if banana pudding weren't luscious enough on its own, we've gilded the dessert lily and layered it with vanilla wafers and a sweet pecan topping. Crush 30 wafers; mix with next 4 ingredients. Spread onto bottom of rimmed baking sheet sprayed with cooking spray. Bake 8 to 10 min. or until golden brown, stirring after 5 min. Cool. Beat pudding mixes and milk in medium bowl with whisk 2 min. (Pudding will be thick.) Stir in 1 cup COOL WHIP. Layer 1/3 of the crumb mixture and half each of the bananas and pudding in 2-qt. bowl; repeat layers. Beat cream cheese and granulated sugar in medium bowl with mixer until blended. Gently stir in 1 cup of the remaining COOL WHIP; spread over top of dessert, sealing to edge of bowl. Sprinkle with remaining crumb mixture. Refrigerate 3 hours. Serve topped with remaining COOL WHIP and whole wafers. Prepare using JELL-O Cheesecake Flavor Instant Pudding.